You can have your oatmeal as thick or as thin as you wish with this units two geared stainless steel rollers that adjust to any setting you wish. 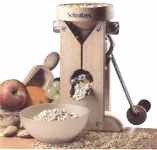 You can process oats, spelt, rice, rye, wheat and oil seeds. The unit can easily process 1/4lb of grain per minute. It is constructed of beechwood.